Medical professionals have to handle hazardous waste every day. Therefore medical health facilities typically partner with reputable medical waste disposal services. Every day, medical professionals handle, seal and send wastes within their own medical facilities and offices awaiting their partner medical waste pick up service. 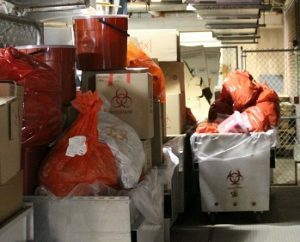 Considering this fact, it’s essential for the healthcare providers to have knowledge of how to treat red bags and containers before the medical waste disposal service picks it up finally. Healthcare facilities have to order a number of types of supplies, such as medical waste disposal bags. When they grow, they may be placed in cabinets for using in the future and may be forgotten. If someone finds an old container of red bags, the best thing to do is to discard them. It’s because such forgotten bags may have been exposed to bacteria, pests, light and other substances and are no longer correct for usage. There may even be minute holes in the plastic which cannot be seen by the naked eye being very small. So, lower the risk of any waste spills by using a brand-new package of supplies. Although red bags are quite strong, they cannot deal with any sharp materials. Therefore, it’s better not to use them for storing blades, syringes and similar items. Official sharp containers should be used to store sharps. However, sharp containers can be stored in red bags because the container is a barrier between the sharps and the plastic. Hazardous wastes are likely to eat through red bags, e.g. formaldehyde; and so, they too must be placed in an alternative container. Certain chemicals cast holes through the bags making them useless. Red bags should be considered by healthcare professionals in the same way as garbage containers. It will be only problematic if these containers will be overfilled and their tops will be tied off. Ideally, the red bags should be filled only partially to the top. You can see a top-fill line in the bags by some brands. After filling the bag this way, it’s easy to tie it off with an associated wrap so that no items will become loose. A medical waste disposal company should have the responsibility of regularly eliminating and replacing red bags. Nevertheless, employees of healthcare facilities need to handle the waste sometimes. Though these wastes are safely packed within the plastic, those who handle them should wear proper gowns, gloves and eye protection, so that even though any item becomes loose, the handler will be safe. Follow these rules and you can be free from the worries of any contamination. Use low-cost, safe, and reliable Anaheim medical waste disposal for companies and facilities within Anaheim, CA. Request a free quote within 10 seconds!